This is going to be one of those posts our earlier followers will appreciate, but our more recent followers may not find interesting. 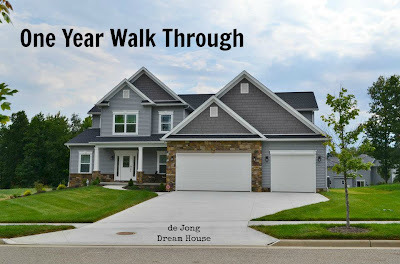 It's the first of a series of posts we'll be writing as we review our home building process now that we've been living here a year. For those of you skipping this post, no worries, we'll be back soon with photos from the slew of projects we completed in the last two weeks. 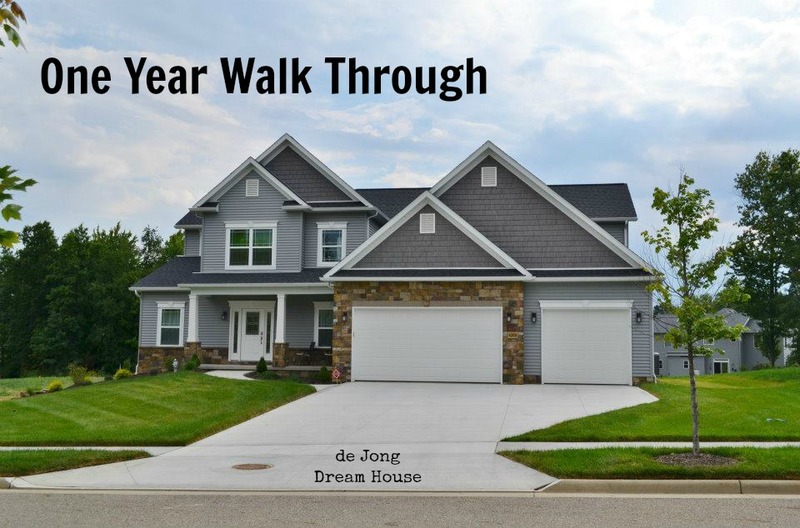 We don't know if it's typical for builders to do a one year walk-through, but our builder scheduled a walk-through with us today to discuss the issues we've discovered in the year we've been living in our house. We thought it might be interesting for those who have been following along to see what items are in our punch list one year later. Overall, we are thrilled with the quality of our home. The items on our walk through list are fairly minor and minimal. Charis has been fantastic to work with in the year since we've moved in, and has quickly come to fix things along the way. For the most part, Charis has been aware of the items below, and in many cases, has already been working with vendors to fix them. The final walk through is meant to make sure that both we and Charis are working off the same punch list. The man doing our walk-through, Kurt, is a much needed addition to the Charis team. He came on after our house was complete so this was his first time seeing our house. For that reason, his response was often that he need to go back to Todd, our contractor, to discuss. We expected this and because of our builder's proven history in making things right we didn't take these responses as inaction. Flaps on the bathroom fans: With strong winds the back-pressure causes the flaps to open and close loudly since it's bare plastic against bare plastic. We wonder if a gasket or pad of some sort could be added to muffle the noise. Action/Response: This has been an issue with several houses and they are still looking for a solution. We will also do some research to see what we can learn. We have several nail pops: We know these are common as the house settles. They aren't in every sill, but in several of them. Action/Response: the painters will come back to fix those. One of the outside faucets leaks: Small drip, but since it's near the foundation we had our builder take a look. Good thing we have ICF so the water can't penetrate and goes straight down to the weepers. Action/Response: the plumber will replace the broken piece tomorrow. 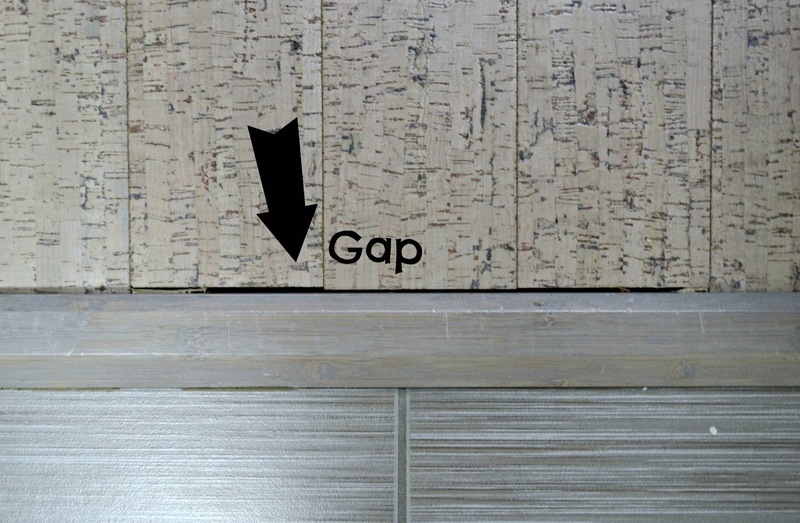 Floor transition -1 -: The transition between kitchen cork and mudroom tile is too high for our ADA goals. Action/Response: Our flooring guy will be replacing it. 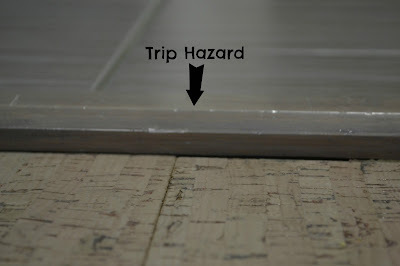 Floor transition -2 -: There is 1/2" or so gap between the cork and the transition. Action/Response: Our flooring guy will be replacing it. Glue residue on one of the Quartz counters: There are were several bits of installation glue on the baking center quartz. Action/Response: Canton Cut Stone was able to remove the glue last week. 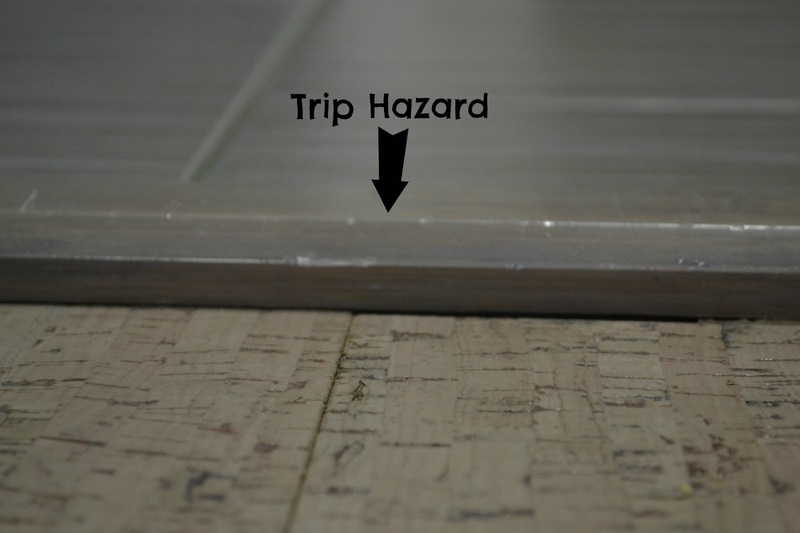 Main sink disposal drain connection loose: The drain connection from the main sink garbage disposal was loose causing water to spill into the cabinet and on to the floor. 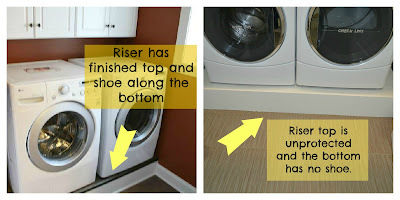 Action/Response: The plumber was here today and replaced the joint. We are very grateful for the prompt response...and that we have two sinks in the kitchen! Ceiling fan wiring / remote: The current fan is our third fan in this room. The first two were bargain ones from Tuesday morning that both stopped working after a few months. The new fan works, but we can't have the fan on without the light. Also, we can only turn on the fan with the remote, not with the switch. And, when the remote is used, it also operates the fan in our master bedroom upstairs! Action/Response: The electrician will be coming out. 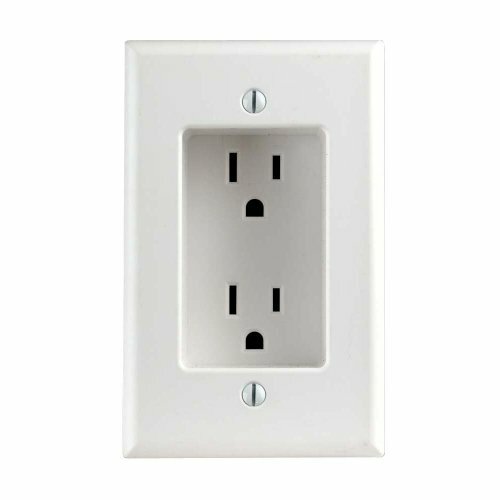 Recessed outlets: We would prefer a recessed outlet where we are planning to hang a TV on the wall. This is one we didn't pay too close attention to during the build. That happens to the best of us... Action/Response: Our electrician will bring the outlet with him when he comes to fix the fan, and we can pay him directly for the work. Rust stain behind left faucet: We saw some rust appear behind the left faucet between the countertop and backsplash. Action/Response: Canton Cut Stone came by last week and resealed and recaulked the granite. The faucet wasn't leaking when the plumber looked at it, but he could see that it had been. He'll check it again when he comes to fix the outdoor spigot. The light above the bathtub is flickering: When we want to use the light above the bathtub it always seem to flicker (no offense to our Dutch readers...). Action/Response: This may be an issue with the kind of bulb we're using, but we should be able to use CFLs. Our electrician will be looking at this, too. Caulking by the tub and shower: Some parts of the shoe are not caulked and/or caulked in the wrong color. 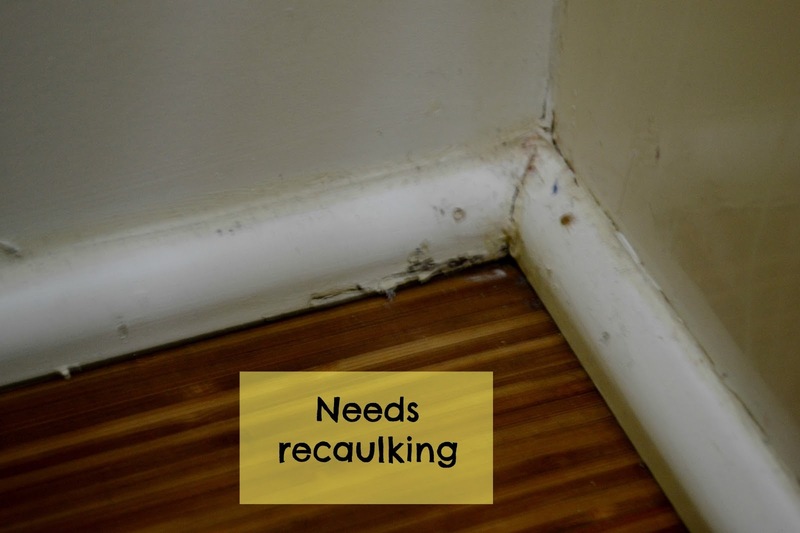 The parts where the caulk is missing could allow water to seep under the floor cover. Action/Response: The painters will come and redo this. The window needs a screen: For some reason, we haven't had much luck getting the right size screen. It's not a big deal to us, but it will be good to have it in eventually. 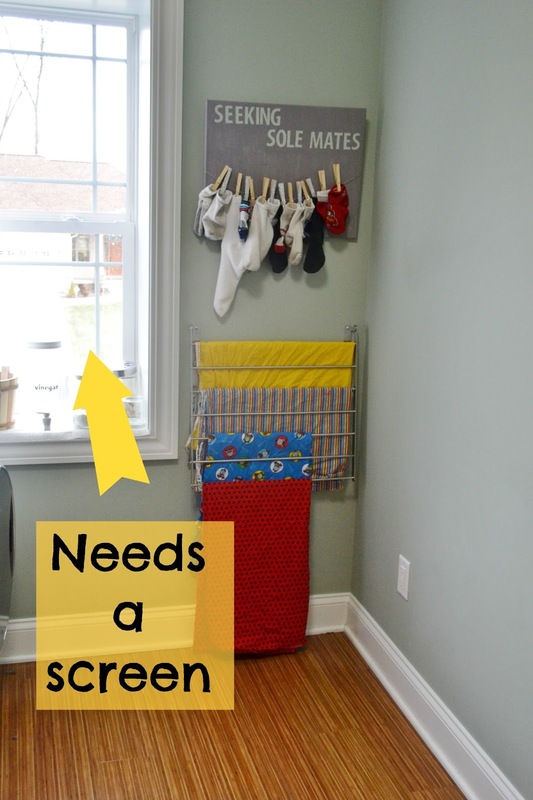 Action/Response: The proper size screen was ordered a few weeks ago and should arrive shortly. Washer / Dryer stability: need something to stabilize them since they bounce around like a hyper-active teenager on hormones. 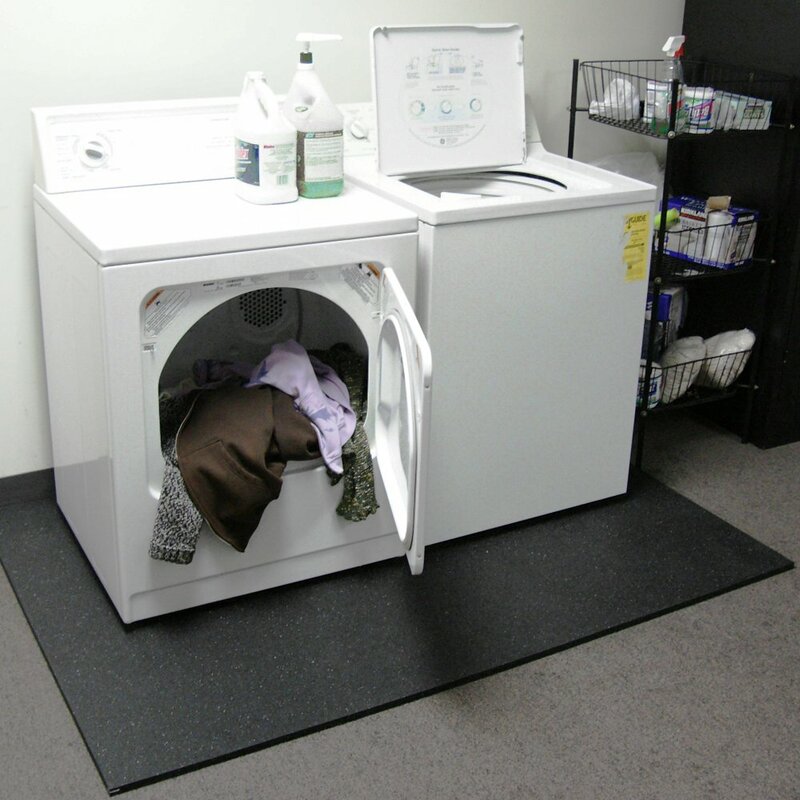 Action/Response: One option is a rubber appliance mat like this. Another option we found are these cork WashPucks. The riser looks unfinished: This was one of the very last things done, and done by a sub with whom communication was a challenge. We should have made a bigger deal then but we were weary of working with him so we put it off. Action/Response: Kurt will talk to our Todd about what can be done. So, one year later, only twenty relatively minor issues with the house. 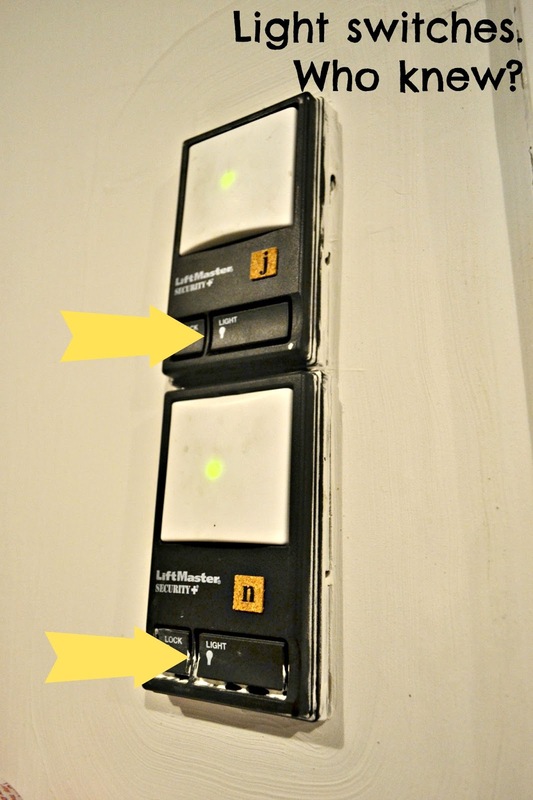 One was our cluelessness(hello, garage opener light switch!) 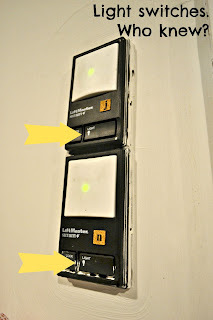 and another one was a simply a matter of changing our mind (hello, recessed outlet!). It sounds like your builder was very through. We have never built a house because all those little details would drive me nuts. Yes, we have been so pleased! Even after all the work we put into our old house, our punch list was longer than this when we moved out! I have to ask about your cork floors. I'm torn on using them, as I have heard a mixed bag of reviews and after bringing a sample home and watching my husband's fingernail take a chunk out of it by accident, we decided cork would be a disaster in the kitchen (what if we dropped a knife, etc.). How has yours held up? If you can share the brand, any sealants, etc. that would be great. We LOVE LOVE LOVE the cork floors. In fact, we are already saving up to replace the carpet in a few rooms with cork. It's so quiet, warm, soft, easy to maintain (no dust bunnies! ), doesn't show dirt (preschoolers dropped granola, yes. dirt, no.) I have dropped a knife on it, and it made only a tiny mark that I can no longer find it (I've read that that cork heals). I've dropped dishes and they've only bounced. (Same dishes on our old hardwood shattered). And, this week our sink pipe burst and water spilled all over the kitchen floor. We wiped it up and there's no warping or damage at all. I would install them again in a heartbeat.